Talk about must-see TV. 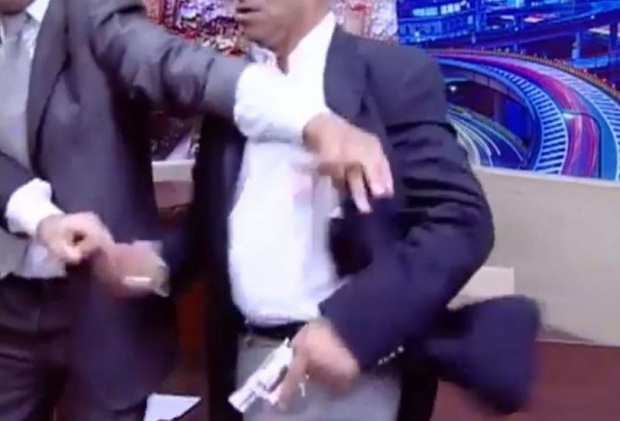 In Jordan, a furious TV debate turned into a YouTube moment when a member of parliament threw a shoe and pulled a gun on his rival. The scene has been replayed on the Web more than 110,000 times, and counting. Luckily, nobody was hurt, although the gun-drawing parliamentarian, identified by the Times of Israel as Mohammed Shawabka, could face attempted murder charges from the political activist named Mansour Sayf al-Din Murad. The video clip shows the two arguing about Jordan's policies toward the uprising in Syria. 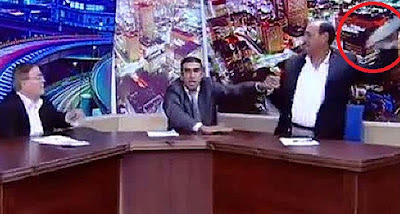 The two begin to shout as the TV host, sitting between them, tries to keep them calm, and fails. The two men discussed aspects of Jordanian politics including attitudes surrounding the uprising in Syria. The debate became increasingly heated and personal, and each of the men accused the other of various crimes and deviances. Shawabka claimed Murad was in the pay of the Syrian regime. Murad countered that Shawabka worked for the Israeli Mossad intelligence agency. "You're a Mossad agent," he said. "You're a big crook," came the response. You don't need to know the language to see what happens next. The MP, told to calm down, instead removes his shoe and flings it as an insult at Murad, who ducks behind his desk, knocking it over. Then the MP pulls out a gun from his waistband and points it at Murad. 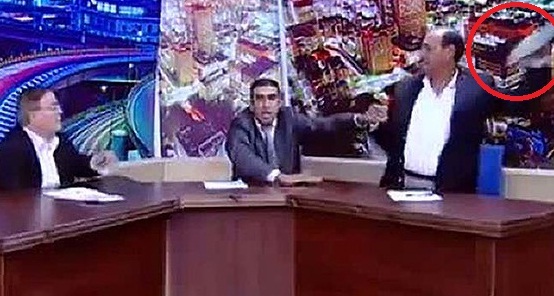 The TV host jumps between the two men to try to stop the fight. While the MP points his gun down and eventually tucks it back into his waistband, the two continue to tussle, the host between them, until eventually someone cuts to credits. Al Arabiya reports that the parliamentarian justified his actions by saying that Murad called members of the Jordanian government "corrupt parasites" and then insulted his father. Murad, according to the Los Angeles Times, reportedly plans to file charges against the member of parliament. Twitter erupted over the video with comments from around the globe like this from Mosa'ab Elshamy,"Because throwing a shoe at the opponent isn't enough anymore." Victoria Kim added, "And I thought Korean politicians couldn't be topped." Pablo V. ‏wondered, "How you throw a shoe then pull out a roscoe on live television AND you're a member of parliament?" This is not the first time a TV debate has turned into a brawl. In Greece last month, a fight broke out on a morning talk show, when the spokesman of the extreme-right party threw water at a woman from the left-wing party, then smacked another woman across the face.